Natural kids' photography is gaining ground as one of the most popular picture taking genres. Gone are the days of posed portraits in stuffy studios. These days, many parents want to capture their children in candid shots that reflect their budding personalities. 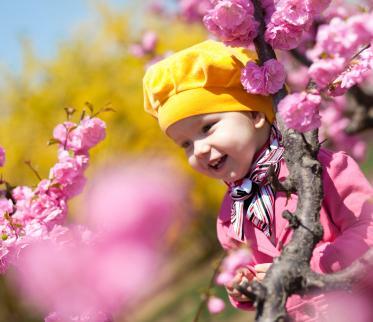 Since the early 2000s, there has been a boom in natural kids' photography. Professional photographers have expanded their services to offer parents a chance to document genuine moments in the children's lives. Instead of carting kids to sterile studios and forcing them to pose in front of boring backdrops and next to tired props, parents are hiring pro photographers to shoot their offspring doing what they do best: being natural. Parks, backyards and gardens are places where kids can be kids and photographers can capture all the fun. Familiar settings allow children to relax and be themselves, which makes picture taking more enjoyable for everyone involved. Embracing this dynamic approach to child photography is sure to result in portraits that tell a unique story about your little one. Natural photography is ideal for newborns, infants and toddlers, as younger kids often feel more comfortable surrounded by their favorite things. Fortunately, you don't have to drain your savings hiring a professional photographer to take natural images of your kids. Rather, consider the following tips to help document your children in their most natural state yourself. Your surroundings may be different, but your subjects are the same. Kids will be kids regardless of where they are. It's important to let them roam and get comfortable with the fact that someone is pointing a camera in their direction. Practice patience and allow the child to warm up to the situation before you get snap happy. If your child is having a tough time adjusting to the camera, then pull out some of his favorite toys and leave him alone. You will be surprised by how quickly his personality shines through when he is engrossed in an activity. Once he forgets about the camera, you will be able to capture all of the unadulterated action. They may be little, but most kids are balls of energy. Don't expect to sit back and relax during a natural kids' photo shoot. Be prepared to run, squat, kneel and contort your body into different shapes in order to capture the best angles. It's important to consider the child's perspective during a photo session. When taking photos of youngsters you should get down to their level, so you don't run into problems with proportion. Background: Since most natural photo shoots take place outside, it's vital that you set-up in areas that feature simple backgrounds, void of clutter. After all, you don't want a fire hydrant or mailbox ruining your shot. Framing: When shooting kids in their natural state you want their bodies to fill as much of the frame as possible, especially if the background is distracting. Don't be afraid of leaning in to get the shot or if you have a skittish child, then employ your camera's zoom to capture close-ups of your youngster's face. Follow rules: Sticking with the same composition with your subject smack in the center of the shot can be dull, especially when photographing little ones in horizontal formats. Remember to apply the rule of thirds and don't be afraid to place your subject slightly off-center to create a more interesting composition. In photography, there are few if any chances for do-overs. This is especially true when photographing kids in their natural environment. The likelihood of having a child do something again because you missed a shot is slim to none. Consequently, you need to be on your game at all times. Also, don't work with equipment that takes a lot of time to set-up and break down. Rather, bring portable, low-maintenance tools that will help you capture the shot as quickly and accurately as possible. Shooting kids in their natural states can be extremely rewarding; however, capturing a frame-worthy shot that illustrates genuine emotion can be challenging. In addition, to the aforementioned tips, consider the age of the child you are photographing. A child's age and temperament will dictate the activities, environment and the approach you should take when shooting natural kid images.